January 24, The Iran Project – In the face of illegal moves to stage a coup in Venezuela and foreign meddling in the country’s affairs, world leaders showed different reactions. Several states condemned the moves as illegitimate, and some others express their support under the banner of democracy. 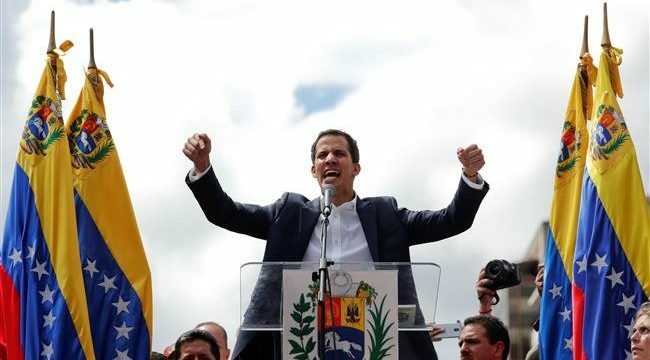 Following two nights of unrest gripped the country which led to the deaths of 14 people, the president of Venezuela’s opposition-led National Assembly, Juan Guaido, has declared himself interim president of the country on Wednesday (Jan. 23). Minutes later, US President Donald Trump recognized Guaido as the “legitimate” interim president of the Latin American country, calling on other governments in the Western Hemisphere to also recognize Guaido. Trump accused by Caracas of plotting to topple President Nicolas Maduro. Back in 2017, Trump said he would not “rule out” a military option for Venezuela to solve the ongoing crisis in the country. In a televised broadcast from the presidential palace, Maduro accused the opposition of seeking to stage a coup with the support of the US, which he said was seeking to govern Venezuela from Washington. Iran, China, Russia, Syria, Turkey, Cuba, and Mexico have so far expressed support for Venezuela. “We hope that as soon as possible any political difference and problem in Venezuela is solved by the people and government of the country using legal and peaceful methods,” he added. China called on the United States to stay out of Venezuela’s current political crisis and says it opposes all outside intervention in the South American country. Russia warned the United States against military interference in Venezuela’s affairs, it would be a disaster, Russian Deputy Foreign Minister Sergei Ryabkov said on Thursday, noting that Moscow stands for the principle of non-interference in internal affairs. The Deputy Foreign Minister stressed that Moscow would support Caracas on the matter, also regretting that the Organisation of American States “was to a large extent involved in this” and “added fuel to the fire”. The Foreign Ministry of the Syrian Arab Republic issued a statement on Thursday that condemned the US’ interference in Venezuela. Syria accused the US of violating international norms and laws in a brazen attack on Venezuela’s sovereignty. Turkey‘s Foreign Minister Mevlut Cavusoglu also said the United States has repeatedly interfered with the domestic politics of Venezuela. Cavusoglu added that it was “very strange” that Venezuela’s National Assembly leader declared himself as interim president despite the country has an elected president. Mexico still backs Maduro as Venezuela president, said government spokesman. Along with the US, Canada and slew of right-leaning Latin American countries including Brazil, Colombia and Paraguay quickly announced support for Guaido. In another development, the European Union called for the launch of a political process in Venezuela that would lead to fresh elections. Also, French President Macron has said “Europe supports the restoration of democracy” in Venezuela.